COTTONWOOD CAMPGROUND, GRAND CANYON NATIONAL PARK, ARIZ. -- Looking up that night from nearly a mile deep inside the Grand Canyon, I saw only one twinkle in the otherwise total blackness. The light hugged the dark silhouette of the canyon's towering walls too closely to be heavenly, but it was far too bright to be a campfire. The Colorado River can be seen flowing through the Grand Canyon from Plateau Point, 1,420 feet above the river. If You Go Back country info: 1-928-638-7875. Fax line: 1-928-638-2125. Information on Grand Canyon National Park: 1-928-638-7888 or www.nps.gov/grca/grandcanyon. For reservations at all other accommodations in the park: Xanterra, 1-888-297-2757 or www.beautiful-places-on-earth.com. Rim to rim shuttle: Van service operates one round trip each day from early May through Oct. 15 for the 215-mile journey by road between the North and South rims. It departs the North Rim at 7 a.m., arrives at the South Rim at noon. The return trip departs at 1:30 p.m. and arrives at the North Rim at 6:30 p.m. The price is $65 per person one-way, $120 round trip. Reservations are required: 1-928-638-2820. And anyway, no stars were visible through the high blanket of clouds. A warm wind ruffled the tall, dry grasses around me as I lay under my sleeping bag contemplating that mysterious light. Then I curled up and drifted into pleasant dreams. Although exhausting, this day had been as mellow as the two before it, and I was truly at peace. Grand Canyon National Park encompasses more than 1.2 million acres along the 277-mile-long gorge the Colorado River and its tributaries have etched into the Kaibab Plateau, a formidable elevation in the desert highlands of northern Arizona. Over the past 10 million years, water and wind have eroded deep, steep-walled arroyos into the slowly rising landscape, revealing a sequence of 21 stone strata that extend into the continent's crust, exposing 3 billion years of the Earth's history. Among the world's most studied landscapes, the canyon offers impeccable records of three of the four eras of geological time, myriad rock features and formations, as well as a rich and diverse fossil record. Numerous caves contain significant paleontological, archaeological and biological artifacts. Awesome perspectives are available in every direction. Natural cathedrals are carved from sandstone and granite. Magnificent waterfalls plunge hundreds of feet in gossamer ribbons. Averaging more than 4,000 feet in depth and 15 miles at its widest, the canyon's ecosystems include five of North America's seven life zones and three of its four types of desert. Its southern rim is a series of desert basins, while balsam forests blanket its higher northern side. From either rim the Grand Canyon is an awesome prospect, but the only way to gain any intimacy with it is to get inside. This time last year, my hiking buddy Rob Ruck and I walked from rim to rim, taking four days to cover the 25 miles, carrying our own gear and camping along the way. 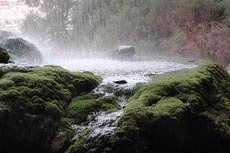 At Lower Ribbon Falls in the Grand Canyon, the constant mist has spawned a lush micro-climate of mosses and ferns on the alcove under the falls. 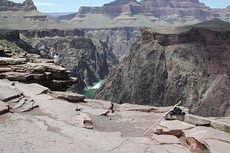 When hiking across the canyon, the logical recommendation is to start on the higher North Rim and finish on the South Rim, because the trip in that direction requires 1,100 fewer feet of vertical climbing. Our problem was that while the South Rim and the canyon itself are open 365 days a year, the North Rim is closed from late October to mid-May, when the approach roads are cleared of snow. The timing of our trip meant we'd be arriving two days before the North Rim was scheduled to open. No matter which direction you walk, unless you can coordinate leaving a car at both rims, the only return option, other than retracing your steps back through the canyon, is to catch the shuttle bus for the 215-mile, five-hour road journey between them. So, we had to start our trek on the South Rim and hope the shuttle would be running when we arrived on the North Rim. We were lucky. The shuttle began operations two days after we started our hike. There are only three designated camping areas along the main cross canyon corridor, and demand for the daily allotment of spaces always exceeds the availability. That makes reservations a must, especially for trips from May through October, although a small number of spaces each day are also held for last minute walk-ups. Advance bookings for in-canyon accommodations are taken on an ongoing basis, but they are not accepted earlier than four months prior to the proposed start date. The best way to get your preferred dates is to fax in a request form on the first day of that month. Once reservations are confirmed, the other details of the trip can be planned. As I was also to discover, there are several different kinds of rim to rim hikers. Some, like us, come bearing weighty backpacks and take several days getting across. Others travel fast and light. Carrying only water and trail food, they start down from either rim before sunrise and reach Phantom Ranch for breakfast, before continuing to the other rim, hopefully before the skies get too dark. While rim to rim is definitely not a stroll in the park, the 24.8 miles is doable in a day by fit, dedicated walkers. Some die-hard types reportedly make the round trip in a one-day double marathon. But Rob and I were looking forward to taking our time. After all, we'd be walking through one of Earth's unique landscapes. With myriad side canyons to explore, quick, cold creeks in which to wallow, waterfalls under which to sit, there was no need to hurry. Our plan was to hike the Bright Angel Trail to the bottom of the canyon, spend two nights at the campground by Phantom Ranch, before hiking up to the North Rim, spending a third night at Cotton campground along the way. Scoring cheap tickets for a flight to Las Vegas, we rented a car and, several days later, drove five hours to the South Rim, where we spent a night in one of the comfortable Maswick Lodge cabins. About 8:30 the next morning, we hoisted our packs and started down Bright Angel Trail. Our destination for Day One was the campground at Bright Angel Creek 9.3 miles away. To eliminate extra weight, we decided to chance the weather and leave the tent behind, but my pack still seemed plenty heavy. In addition to a sleeping bag, ground cloth, inflatable mat, extra T-shirt and pair of shorts, and other gear, we were carrying provisions for three days. Although we'd be eating two breakfasts and dinners at the canteen at Phantom Ranch, we still needed to bring food for four lunches and one dinner, along with minimal cooking gear. And of course, we each carried several water bottles for the day, as well as warmer clothes to wear once we reached the North Rim. Extra pounds add up quickly when you're carrying it on your back, and the maxim of the inner canyon is that, other than water, if you pack it in, you pack it out. Bright Angel Trail starts in a series of steep switchbacks, which traverse the layer of Kaibab limestone into the tan sandstone of the Toroweap Formation, then downward through Coconino Sandstone, into the softer muds of the Hermit shale and the Supai group. The rest houses at the mile-and-a-half and three-mile marks are places to re-water, (seasonally) get out of the sun, rest the legs and contemplate the canyon's grandeur. Below the lower rest house, Bright Angel follows another series of tight switchbacks known as Jacob's Ladder etched by use and constant maintenance into the sheer cliffs of three limestone layers, the Redwall, Temple Butte and Muav, before emerging onto the broader layer of Bright Angel shale that makes up the Tonto Plateau, the mud that collected at the bottom of a shallow sea some 550 million years ago. In many ways, hiking into the Canyon is more demanding than climbing out. Each step down the steep path stresses the knees, shins and feet, especially the toes, which get rammed into the boot tips. These effects are exacerbated by the weight of the pack. After several hours of this effort, many hikers start to take on the stiff-back bow-legged gait that Canyon veterans jokingly call the "Kaibab Shuffle." The May morning was clear under a blazing sun. About noon we trudged into Indian Gardens, the green oasis that marks the halfway point on the journey down to the river. That was when I had my first animal encounter. Just as we were entering the area where the trail mules are hitched, I realized I was hearing a characteristic rattle on the hillside just behind me. Turning my head quickly, I spotted the fist-sized, wedge-shaped head of a rattler disappearing into the dry brush a few feet away. That certainly made me extra conscious of watching where I stepped. It was good to get our packs off. Under shady trees, we ate the sandwiches we had purchased that morning for lunch. Because we were only heading to Phantom Ranch that day, we felt we had time to take a mile-and-a-half side trip from Indian Gardens out to Plateau Point with its incredible views of the Colorado River 1,420 feet below. So we stashed our packs behind a bush and hiked out to the stupendous precipice. Despite the baking heat of the afternoon, I was glad we made the effort. From that perspective inside the great gash of the canyon, we could see down to the river and up to the South Rim. All around the rocky record of Earth's evolution was revealed. Like tiers of a collapsing wedding cake, each cliff and terrace represents a different geologic era, stair steps descending down to the continent's bedrock. The landscape across the river was a profusion of erosion-carved buttes several thousand feet high. The most prominent were fancifully labeled by early explorers as temples to various gods of Egypt, India and China, such as Isis, Ra, Set, Brahma, Buddha, Confucius and Zoroaster. All are evidence of the power of geologic dynamics and water being drawn back to the sea by gravity's inexorable pull. An hour later and back on the main trail, we continued down into the Tapeats sandstone layer, past what is known as the Grand Canyon Supergroup, deposited between 800 million and 2 billion years ago. Down the tight turns of the Devil's Corkscrew we wandered through the Vishnu Schist, a thick layer of lava-laced sediment laid down more than 2 billion years ago. This is the bedrock of the continent, and some of the oldest exposed rock on the planet. Here and there, rose-colored seams of Zoroaster granite lace across the Schist face, formed at the dawn of time by standing seams of metamorphized lava. Lost in weariness and thoughts of Earth's eons, we turned a final bend and beheld the pale green ribbon of the Colorado rushing by. But it was still a healthy hike upriver to the pair of bridges that are the only crossings for a hundred miles in either direction. Once on the other side, the stony trail paralleled Bright Angel Creek to the campgrounds and Phantom Ranch. It was past 4 p.m. when two tired hikers trudged in. We found our campsite along the creek, spread out our sleeping bags and relaxed until dinner. Meals at the Phantom Ranch canteen (dinner and breakfast) are served family style in two seatings, with a menu that hasn't changed much in decades. Reservations are required and arriving late is frowned upon. Along with lots of hearty fare, meals include plenty of conversation with a table full of interesting strangers from all over the planet, most of whom have exerted considerable effort to reach this remarkably remote place. After dinner, we retired to the circle of benches outside and enjoyed Park Ranger Laura's telling of the human history behind this outpost at the bottom of the Grand Canyon. An hour later under a darkening sky, we made our way back to the campsite and spread our sleeping bags under the rapidly emerging stars. Dusk does not linger at those depths. With the stars over our heads and Bright Angel Creek gurgling only a few feet away, sleep came quickly. The Bright Angel campsite started stirring well before sunrise. Some were getting up for the first breakfast, while others were already breaking camp and shouldering packs to start their climb out while it was still cool. Having a free day at the bottom gave us the luxury of time to both recuperate from the previous day's exertions and to explore a bit of the inner canyon. After breakfast, we relaxed for an hour, then packed lunch and water and headed out. First, we hiked several miles up the Clear Creek Trail, which climbs steeply out of the canyon bottom and along a ledge that overhangs the river's Granite Gorge 1,400 feet below before emerging on the Tonto Plateau. It wasn't yet 10 a.m. when we reached the bottom edge of the plateau, but the heat of the sun dissuaded us from venturing farther on to that baking expanse. We found a cool, secluded spot in the shade of a wide ledge and spent an hour alternately absorbing the incredible view and napping. In that time, only one other person came by on his way to Clear Creek six miles across the Tonto. Then we climbed back down to Bright Angel Creek and followed it upstream for a mile, crossing several foot bridges until we reached the mouth of Phantom Canyon. Wading across the creek, we picked our way for maybe another mile along this much less traveled trail through the deep, sheer walled side canyon, which we had all to ourselves. Following the stream (with me keeping up a steady, nonsensical monologue to amply warn any snakes of our approach), we eventually arrived at another perfect spot, where a sunny alcove had been worn into the variegated granite walls of the cliff overlooking a deep, cool pool. Seeing no need to venture farther, we made ourselves comfortable, swimming in the pool and natural flume above it, then warming up in the alcove. We must have been having fun, because two hours vanished before we realized it would be wise to head back to camp for dinner. Walking out of Phantom Canyon, we happened on two guys who were scaling a broad face of the sheer stone wall several hundred feet above us. We marveled at their daring for a few minutes before continuing, but a half hour later as we were nearly at camp, the same two guys came scurrying past us and we realized both were part of the canteen crew. Later we learned that kitchen staff work breakfasts and dinners daily for three weeks and then get one week off. It occurred to me that it would be great to have so much time to explore and play in the canyon. North Kaibab Trail runs 14.5 miles from the Bright Angel campground to the North Rim, but our plan was to hike just more than halfway that day, stopping at Cottonwood Campground. We expected it to be a relatively easy trip, because although this leg was half the distance to the top, it was less than a third of the nearly 6,000 vertical feet we'd have to climb to get out. Though its gradient is gradual, North Kaibab wiggles up through the deep gash Bright Angel Creek has worn into the Vishnu Schist. After walking for more than an hour up through the narrow, shaded section known as the Box, wedged between sheer walls 1,200 feet high, we finally emerged onto the sun-baked blaze of the Tonto Plateau. The leafy oasis of Cottonwood Campground was still several miles of hot, hard up and down away, and before long, each step became a real effort for me. I stopped repeatedly under occasional patches of shade to rest and sip before forcing myself forward. It was early afternoon when we finally reached the small camping area set in a rare grove of cottonwoods, and I was so worn I was starting to wobble. Selecting a site that offered a modicum of shade, we had a bite of lunch and decided what to do with the rest of the afternoon. I was inclined to laze in the shade, but Rob insisted that we hike two miles back down the trail to explore Lower Ribbon Falls, which he'd visited years earlier. I was skeptical about walking extra miles in the sun just to see a waterfall, but he prevailed. Later I was glad he did. The waters of Ribbon Creek leach calcium carbonate from the limestone layers high above its majestic 200-foot high falls. As the creek tumbles through the air, the mineral precipitates out of the eternal spray, and over the eons it has created a 50-foot high cone of purplish rock called travertine. We climbed up around the back of the cone to the top and found ourselves a throne on a high, dry ledge behind the spray. We took turns standing in the shower atop the cone under the full falls, an Eden of eternal refreshment in a deep and baking desert. No high-tech water park ever provided a more glorious diversion. Again, the afternoon sped by, and we wound up quick pacing our way back to camp before darkness arrived. We cooked the only hot meal we'd brought along, 8-ounce sacks of freeze-dried Stroganoff, which required only boiling in a pot of water. Of course, that had also meant bringing along a pot and a small gas burner. The small flame took a long time to boil the water, but that was OK, since the preparation and eating of dinner was the evening's only entertainment, other than marveling at sounds and senses of the emerging night. I checked my watch as we crawled under our sleeping bags, which we'd moved out into the open. It was 8:45 p.m. That's when I noticed that mysterious light on the high side of the side canyon known as the Transept. As promised, the 6.9-mile hike from Cottonwood to the North Rim proved a challenge, especially since I had brought several pounds of food and gear I wound up not needing. The first two miles are easy going until the trail crosses Bright Angel Creek and heads up Roaring Springs Canyon. Then it climbs seemingly straight up, gaining more than 4,000 feet of elevation in the final five miles. Steep, narrow and rocky, the trail is a marvel of construction and maintenance, snaking though tight crevasses and rock cuts, under massive overhangs and along sheer cliffs that plunge 1,000 feet. As we made our way steadily upward, the scenery was so breathtaking I had to pause frequently to catch mine. There was plenty to take in and contemplate. We could watch eagles and vultures soar, and appreciate the reverse geology lesson, as we climbed through the succeeding layers of stone. The sheer wall of the Coconino sandstone was the final obstacle, and it was after 4 p.m. when we emerged onto the hanging overlook at its top. The scenic overlook thronged with day visitors snapping pictures, but we were canyon veterans, content to sit quietly and rest. Seeing back to the South Rim and realizing how far we had come filled me with a weary sense of accomplishment. Still for all the steps we'd walked, the ribbon of our route traversed less than one two hundredths of the Grand Canyon's length. We had seen much, but there was so much more to explore. We still had a mile to the trailhead and two more to the North Rim lodge, where we'd booked a rustic cabin for the night. We were grubby and felt out of place in the check-in line amid so many clean visitors, but after a shower, shave and short rest we were ready for civilization. As I walked over to make reservations for dinner, the maitre d' gave me an appraising look. "Doing the Kaibab shuffle?" he smiled wryly. I nodded, and, despite the line, he found a table for us within 20 minutes. The North Rim lodge is a magnificent log structure perched on the lip of a high mesa known as the Peninsula. The 180-degree panorama through the huge glass windows of the lodge's great hall is incomparable, with the South Rim faintly visible through the hazy veil. After enjoying a nice dinner in the large restaurant, we strolled along the cliff side promenade out to Bright Angel Point, a narrow finger of rock pointing into the void. For half an hour, we listened to the dusky voices of the canyon and watched as the setting sun turned its walls a thousand shades of red. When the natural fireworks show was over, we turned back to the lodge with its great windows now aglow, and suddenly I realized the source of my mystery light from the night before. Back country reservations: Requests are taken on an ongoing basis, but not earlier than four months prior to the proposed start date. Many fax in their requests on the first day of a given month, when up to 800 flood in. Requests are answered in the order received. There's a nonrefundable reservation fee of $10 per camping permit and charge of $5 per person per night. That's in addition to a park entrance fee of $20 per vehicle.